Canada, a land of vast distances and rich natural resources and a nation of immigrants, with a population of over 32 million people, is the second largest country in the world. Canada was born as the country we know today on July 1st, 1867 when the four colonies of British North America united to create a single country. 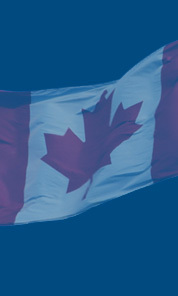 Canada celebrates its birthday every year on July 1st (Canada day). Canada is located in the northern North America bordering the North Atlantic Ocean on the west, and the Arctic Ocean on the north. It has a total area of 9,976,140 km2 of which 9,220,970 km2 is land and 755,170 km2 is water. The temperature climate varies from mostly moderate temperature in south to sub-arctic and arctic in north. Its terrain varies from mostly plains with mountains in west and lowlands in southeast. Canada’s legal system is based on English common law, except in Quebec where the civil law system based on French law prevails. In 2005 employment by industry in both goods producing sectors and service producing sectors were most prosperous in the following industries: trade, manufacturing, healthcare and social assistance, educational services, construction, professional scientific and technical services, accommodation and food services, finance, insurance, real estate, and leasing. Canada needs new immigrants as the population in Canada is continuing an aging trend due to two main factors: a decrease in fertility and an increase in life expectancy. Canada is looking for new immigrants with sufficient business experience and capital who can contribute to Canada’s growing economy and immigrants with new skills and knowledge to keep Canada at the cutting edge of technology. Located on the west coast of Canada, British Columbia or B.C. is the third largest Canadian province with a population of over 4.2 million people. It is bound by the Pacific Ocean on the west, the state of Alaska on the Northwest, Yukon and the Northwest Territories on the North, Alberta on the east, and the state of Washington, Idaho and Montana on the south. B.C.’s capital, Victoria, is located at the southeast tip of Vancouver Island. B.C.’s most populous city is Vancouver which is located in the southeast corner of the mainland and a population of over 2 million. B.C.’s ten largest municipalities by population are Vancouver, Surrey, Victoria, Burnaby, Richmond, Abbotsford, Coquitlam, Saanich, Delta, Kelowna. The north side of the province has cold and snowy winters but in the southern portions of the province, in Vancouver and Vancouver Island, the temperatures are moderate. Industries such as construction, trade, information technology, tourism and recreation as well as educational services have had a strong growth in B.C. in 2005. Moreover, at 4.9%, B.C. has had one of Canada’s lowest unemployment rates in over three decades. Ontario, with a population of over 12.5 million, is the most populous province in Canada representing approximately 37.9% of the total Canadian population. It is also the second largest in area of Canada’s ten provinces. Ontario’s capital, Toronto, is the most populous city in that province. Ottawa, the capital of Canada is also located in Ontario. Ontario is bounded on the north by Hudson Bay and James Bay, on the east by Quebec, on the west by Manitoba, and on the south by the states of Minnesota, Michigan, Ohio, Pennsylvania and New York. Five largest municipalities by population in Ontario are: Toronto, Ottawa, Mississauga, Hamilton, and London. The weather in Ontario varies by region but generally the south including Greater Toronto Area receives fairly warm weather in the summer and snowy weather in the winter. Almost 60% of all manufactured exports coming out of Canada come from Ontario. Although Agriculture was once the dominant industry in Ontario, it now occupies a small percentage of the population. The most common types of farms are cattle, small grains, and dairy. Ontario’s rivers, particularly the Niagara River, make it rich in hydroelectric energy which has greatly contributed to making manufacturing the principal industry, found mainly in the Golden Horseshoe region, the most industrialized area in Canada. Important products include motor vehicles, iron, steel, food, electrical appliances, machinery, chemicals, and paper. Toronto is the centre of Canada’s financial services and banking industry. Brampton and Mississauga are large product distribution centres, as well as having automobile related industries. The information technology sector is also important especially in Markham, Waterloo, and Ottawa. In Northern Ontario, mining and the forest products industry such as pulp and paper are the dominating industries. Tourism also is a major contributor to Ontario’s economy particularly in central Ontario and border cities. Ontario’s unemployment rate, at 6.1%, lies under the national unemployment rate. Quebec is the largest Canadian province in area and with a population of over 7.6 million, it is the second most populous province after Ontario. Quebec’s official language is French. It is the only province where English is a minority language. The capital of Quebec is Quebec City. The largest city in the province of Quebec is the city of Montreal with a population of approximately 2 million. Montreal is the vibrant, cosmopolitan metropolis of Quebec. Five largest municipalities by population in the province of Quebec are: Montreal, Quebec City, Longueuil, Laval, Gatineau. Around the St. Lawrence River Valley which is a fertile agricultural region, Quebec produces dairy products, fruits, vegetables, and livestock. As well, Quebec is the largest producer of maple syrup. Some of the most important industries in Quebec are pulp and paper, lumber, and hydroelectricity due to Quebec’s rich resources in forests, lakes, and rivers. Quebec’s unemployment rate currently lies at 8%.High-tech industries such as aerospace companies like Bombardier, and the jet engine company Pratt & Whitney and numerous others have a strong presence around the Montreal region. Alberta is a western Canadian prairie province with a population of over 3.2 million people. The Rocky Mountains are Alberta’s most recognizable geographic feature. On the base of the Rockies is where much of Alberta’s oil and gas are found. Alberta is bound by British Columbia on the west, the Northwest Territories on the north, Saskatchewan on the east, and the state of Montana to the south. Alberta’s capital, Edmonton, is located almost exactly in the centre of the province and is where most of Alberta’s oil is refined. However, it’s most populous city and metropolitan area, Calgary, with a population of around 1 million, is Alberta’s commerce centre and is located in the southern region of the province. Alberta’s five largest cities by population are Calgary, Edmonton, Red Deer, Lethbridge, St. Albert. Alberta is the largest producer of conventional crude oil, synthetic crude, and natural gas and gas products in the country. At 4.1%, Alberta has the lowest unemployment rate in all of Canada. The industries with largest job gains in Alberta have been in the wholesale trade, professional, scientific and technical services, and educational industry. Natural resources continued to strengthen as the result of intense oil and gas activities. As well, agriculture has a significant position in the province’s economy. Over 5 million cattle are residents of the province at one time or another. Nearly one half of all Canadian beef is produced in Alberta. Alberta is one of the prime producers of plains buffalo for the consumer market. Sheep for wool and mutton are also raised. Wheat and canola are primary farm crops with Alberta leading the provinces in spring wheat production. Manitoba with a population of approximately 1.2 million is the easternmost of the three Prairie Provinces in the heart of Canada. It is often referred to as the “land of 100,000 lakes”. Its capital and largest city, Winnipeg, contains more than half of the province’s population. Manitoba borders Saskatchewan to the west, Ontario to the east, Nunavut to the north, and the states of North Dakota and Minnesota to the south. Manitoba’s five largest municipalities by population are Winnipeg, Brandon, Thompson, Portage la Prairie, and Springfield. Manitoba has a diversified economy led by manufacturing, the agriculture, hydroelectricity, and mining. At 4.2%, Manitoba’s unemployment rate is the second lowest in all of Canada. The province of Newfoundland and Labrador, with a population of over 500 thousand, is Canada’s most eastern province and is made up of the island of Newfoundland and Labrador which is on the mainland of Canada. In 2001 the name of the province changed from Newfoundland to Newfoundland and Labrador. Newfoundland’s nearest neighbour is the small French overseas community of Saint-Pierre and Miquelon. The province’s capital, St. John, with a population of over 120 thousand, is located on the southeastern tip of the island and is considered to be the oldest city in English speaking North America. Newfoundland has its own time zone, set apart from the North American East Coast by half an hour, instead of the traditional one hour difference. Five largest communities in Newfoundland and Labrador by population are: St. John’s, Mount Pearl, Corner Brook, Conception Bay South, and Grand Falls-Windsor. One of the original four provinces of Canada, New Brunswick is the only officially bilingual province in Canada. New Brunswick is largest of the three Canadian Maritime Provinces and has a population of approximately 750 thousand. Capital of New Brunswick is Fredericton. About 80% of New Brunswick is forested, with the other 20% consisting of agricultural land and urban areas laying mostly in the south of the province. Five largest municipalities in New Brunswick by population are: Saint John, Moncton, Fredericton, Miramichi, and Edmundston. New Brunswick has a modern based economy dominated by financial services, insurance, health care, and educational services. New Brunswick’s largest city, Saint John, is a port city with heavy industry in the form of pulp and paper, oil refineries, and drydocks. Moncton, the second largest city in New Brunswick, has the fastest growing metropolitan population in the province. It is principally transportation, distribution, commercial and retail centre with important rail and air transportation facilities. The rural primary economy is best known for forestry, mining, mixed farming and fishing. The most valuable crop is potato while the most valuable fish catches are lobster and scallops. New Brunswick’s unemployment rate currently lies at 9.5%. Nova Scotia, the most populous of the Maritimes provinces, is located on Canada’s south eastern coast. Nova Scotia is the second smallest province in Canada, with an area of only 55,284 km2, but a population of around 1 million. Its capital, the Halifax Regional Municipality, is the economic and cultural centre of the province. Five largest municipalities by population are: Halifax, Cape Breton, Kings County, Colchester County, and Yarmouth County. Nova Scotia has a resource based economy and an unemployment rate of 8.2%. Industries such as fishing, mining, forestry, agriculture, tourism, and technology are the most important industries in that province. Prince Edward Island or P.E.I., with a population of around 140 thousand, is one of Canada’s Maritime provinces. Known as the “birthplace of confederation”, P.E.I. is Canada’s smallest province in terms of both size and population but it has the highest population density in all of Canadian provinces. The island is located in the Gulf of Saint Lawrence, east of New Brunswick and north of Nova Scotia. P.E.I.’s capital and largest city is Charlottetown, situated centrally on the island’s southern shore. Four largest cities by population in P.E.I. are Charlottetown, Summerside, Stratford, and Cornwall. Most cities in P.E.I. are built around natural harbours. Due to the island’s distinctive red sedimentary soil, virtually the entire province is dominated by agriculture. In recent years, potatoes have replaced mixed farming accounting for one-third of provincial farm income. The province currently accounts for a third of Canada’s total potato production, producing seed potatoes and exporting to more than 20 countries around the world. Other industries dominating the province are tourism and fishery. Over a million visitors per year vacation at P.E.I. using its beaches, golf courses, and local attractions and events. Fishing at P.E.I. is mostly dominated by shell fish harvesting – most notably lobster. With a population of around 1 million, Saskatchewan is the middle province of Canada’s three prairie provinces. Most of its population lives in the southern part of the province in the city of Saskatoon. The capital of Saskatchewan, Regina, is the second most populous city in that province. Five largest municipalities in Saskatchewan in order of population are: Saskatoon, Regina, Prince Albert, Moose Jaw, and Yorkton. Saskatchewan produces more than half of the wheat grown in Canada. As well as wheat, Saskatchewan is also producer of other grains such as canola, flax, rye, oats, peas, lentils, canary seed and barley. At 5.2%, Saskatchewan’s unemployment rate lies beneath Canada’s national unemployment rate. Saskatchewan is also the world’s most important supplier of uranium which enables the province great latitude in setting world uranium prices.